This rug is one of its kind and is a perfect piece as a wall hanging. It has taken more than 10 months to weave this beauty. The primary color are ivory, orange. This is ideal for the guest room. This magnificent carpet is highly durable and hand washable. 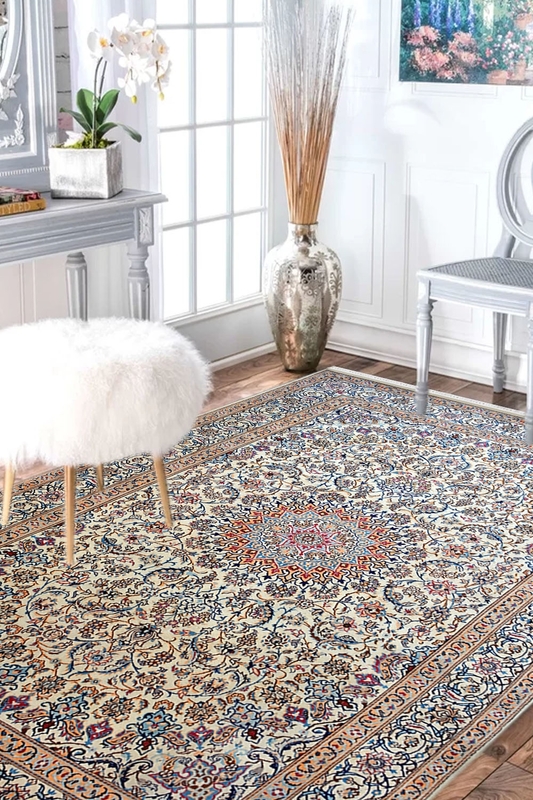 Queen of Persia is really a stunning handknotted carpet which is handknotted in pure New Zealand wool and finest quality of the cotton material. It has a smooth ivory color which is obviously suitable for the low traffic area. Due to the soft and smooth color, it can easily match with any kind of furniture. This carpet gives a royal look once it will be placed. So make a focal point and find the compliments regarding this “One of a kind” Hand-knotted carpet by buying it from Rugs and Beyond. It has a beautiful pattern in the central area which is the main eye-catching area. So use a transparent table when on it so that you can show the design of this carpet to your guest and impress them.